Times says Barclays Center serves as magnet for yellow cabs; "clear ripples" from arena, but no mention of impact of black cars, livery cabs idling on residential streets. That's part of "new normal," too. Update: in print, this article takes up 3/4 of the front page of the New York section. Contrast that with the five paragraphs devoted to the June 2009 renegotiation of the MTA deal, when the Times buried a story that suggested developer Forest City Ratner might be getting a sweetheart deal from a government agency. Would you believe that the opening of the Barclays Center has doubled pickups by yellow cabs in the vicinity? 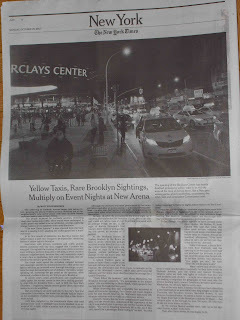 The New York Times explores that phenomenon in an article published tonight on the web, in print tomorrow, headlined Yellow Taxis, Rare Brooklyn Sightings, Multiply on Event Nights at New Arena. Interviews with drivers, residents and traffic guards nearby, combined with city data, suggest that a pattern has emerged: throughout the evening of an event, drivers become more willing to perform drop-offs in the area, or even cruise in adjacent neighborhoods, because they can reasonably expect a return fare to Manhattan. And once an event ends, they descend on the arena to greet the crowd as it leaves. ...So far, though, the arena appears to have created some clear ripples. Mo Mullen, 32, from Clinton Hill, said that while she often used for-hire vehicles, she had in recent weeks stumbled upon yellow taxis on Atlantic Avenue on weekend afternoons. “I’ve been about to call a car service and then a taxi drives by,” she said. I tweeted to the author, Matt Flegenheimer, pointing out the failure to mention some other clear ripples: black cars and livery cabs idling on residential streets. I noted that a reliance on consultant Gridlock Sam Schwartz, TLC Commissioner David Yassky, and Brooklyn Borough President Marty Markowitz missed the rest of the story, which includes video of idling limos and frustration expressed by the police, who don't have a solution. Hear ya, but story doesn't make a quality of life argument. Just laying out what appears to be a new normal for yellows. I also pointed him to another "new normal," with some concerts: pounding bass *inside* people's homes. He said he'd pass it on. Will the Times portray this as residents "finding another reason to complain"? Or will the paper recognize the failure of design, operation, and oversight? Heck, I couldn't get acknowledgments, much less responses, from the purportedly 24/7 representatives of the arena and state, Terence Kelly and Derek Lynch.